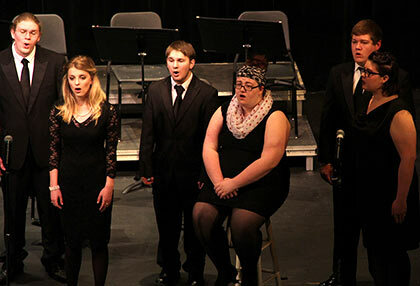 The Cowley College Singers and Cowley Jazz Band took to the Robert Brown Theatre stage to perform a free jazz concert on Friday, November 18. The CC Singers, led by director of vocal music David Smith, performed Over the Rainbow (soloist Riley Paye), And So It Goes, Love Walked In (soloist Molly McCann), and You Are the New Day. The Cowley Jazz Band, led by Jazz Band director Tyler Gauldin, performed Tuxedo Junction, Pennsylvania 6-5000, Here’s That Rainy Day, A String of Pearls, and Boogie Woogie Bugle Boy. CC Singer members were: Jazmynn Burris, Molly McCune, Kaitlyn Stallard, Kelsey Carpenter, Riley Paye, Taryn Stone, Tiffany Tatum, Caleb Bettles, Jordan Fox, Stephan Harris, Austin Crowe, Austin Sherman, and Avery Wright. Jazz Band members were: Elizabeth Gregory, Ramon Ortega, Todd Clubine, Garrett Misora, Kim Wong, Braylea King, Alyssa Looney, Josh Waldorf, Gregory Coppola II, Riley Gatton, Katherine Austin, and Stephen Muckenthaler.